Transfer Cars provide linear product transportation. By selecting optional equipment mounted on top of the transfer car, in-line and perpendicular loading and unloading can be accomplished. Options for lifting and tilting product are also available. The below chart lists “standard” Transfer Cars in which we manufacture and sell with highly competitive pricing and lead times. Rolmaster can accommodate most custom “non-standard” Transfer Car requests. TC19 Model TC19 Gauge Roller Transfer Car This Transfer Car is typically used for transferring product to adjacent conveyors in parallel conveying lines. 4" V-groove steel and 5" phenolic. 1" Sch. 40 black pipe with plastic hand grip. 2500 lb 36" to 120" in 1" increments. 1.9" dia., 16 ga. wall tubes with 7/16" hex cold rolled steel axles, spring retained. Standard A10 bearings are light oil lubricated. 250 lbs. roller capacity. 2.00 in 3.00 in 4.50 in 6.00 in 9.00 in 12.00 in Set High 5" x 1-1/2" x 3/16" formed steel channels with 5-1/2" x 1-1/2" x 3/16" bolted channel crossties Standard widths are 13, 17, 19, 21, 23, 25, 27, 31, 33, 37, 39, 43, 47 and 51 inches 4" V-groove steel and 5" phenolic. 1" Sch. 40 black pipe with plastic hand grip. 2500 lb Non-precn, grease packed 13-51 in Floor mounted track. TC25 Model TC25 Gauge Roller Transfer Car This Transfer Car is typically used for transferring product to adjacent conveyors in parallel conveying lines. 4" V-groove steel and 5" phenolic. 1" Sch. 40 black pipe with plastic hand grip. 2500 lb 36" to 120" in 1" increments. 2.5" dia., 11 ga. wall tubes with 11/16" hex cold rolled steel axle, spring retained. Standard A50 bearings are light oil lubricated. 750 lbs. roller capacity. 3.00 in 4.50 in 6.00 in 9.00 in 12.00 in Set High 5" x 1-1/2" x 3/16" formed steel channels with 5-1/2" x 1-1/2" x 3/16" bolted channel crossties Standard widths are 13, 15, 17, 19, 21, 23, 25, 27, 31, 33, 37, 39 ,43, 47, 51 4" V-groove steel and 5" phenolic. 1" Sch. 40 black pipe with plastic hand grip. 2500 lb Non-precn, oiled 13-61 in Floor mounted track. TC26 Model TC26 Gauge Roller Transfer Car This Transfer Car is typically used for transferring product to adjacent conveyors in parallel conveying lines. 4" V-groove steel and 5" phenolic. 1" Sch. 40 black pipe with plastic hand grip. 2500 lb 36" to 120" in 1" increments. 2.625" dia., 7 ga. wall tubes with 11/16" hex cold rolled steel axle, spring retained. Standard A50 bearings are light oil lubricated. 750 lbs. roller capacity. 3.00 in 4.50 in 6.00 in 9.00 in 12.00 in Set High 5" x 1-1/2" x 3/16" formed steel channels with 5-1/2" x 1-1/2" x 3/16" bolted channel crossties Standard widths are 13, 15, 17, 19, 21, 23, 25, 27, 31, 33, 37, 39 ,43, 47, 61 4" V-groove steel and 5" phenolic. 1" Sch. 40 black pipe with plastic hand grip. 2500 lb Non-precn, oiled 13-51 in Floor mounted track. PTTC19 Model PTTC19 Gauge Roller Thru Transfer Car Typically used to transfer products across an aisleway in parallel conveying lines. Requires TC4 track sold seperately. 4" Cast Iron V-Groove and 5" Phenolic. 1" pipe with hand grip. 2500 lb 60-120 in 1.9" dia., 16 ga. wall tubes with 7/16" hex cold rolled steel axles, spring retained. Standard A10 bearings are light oil lubricated. 250 lbs. roller capacity. 3.00 in 4.50 in 6.00 in Channel, PTTC19, 5"x1-1/2"x3/16", rollers set 1/4" high 4" Cast Iron V-Groove and 5" Phenolic. 1" pipe with hand grip. 2500 lb Non-precision, grease packed, 7/16" hex axle 15-51 in Floor mounted track. Larger pass thru clearance. PTTC25 Model PTTC25 Gauge Roller Thru Transfer Car Typically used to transfer products across an aisleway in parallel conveying lines. Requires TC4 track sold seperately. 4" Cast Iron V-Groove and 5" Phenolic. 1" pipe with hand grip. 2500 lb 60-120 in 2.5" dia., 11 ga. wall tubes with 11/16" hex cold rolled steel axles, spring retained. Standard A50 bearings are light oil lubricated. 750 lbs. roller capacity. 3.00 in 4.50 in 6.00 in 9.00 in 12.00 in Channel, Set High 5" x 1-1/2" x 3/16" formed steel channels with 5-1/2" x 1-1/2" x 3/16" bolted channel crossties see available BFR 4" Cast Iron V-Groove and 5" Phenolic. 1" pipe with hand grip. 2500 lb Non-precision, oiled, 11/16" hex axle 15-51 in Floor mounted track. Larger pass thru clearance. PTTC26 Model PTTC26 Gauge Roller Thru Transfer Car Typically used to transfer products across an aisleway in parallel conveying lines. Requires TC4 track sold seperately. 4" Cast Iron V-Groove and 5" Phenolic. 1" pipe with hand grip. 2500 lb 60-120 in 2.625" dia., 7 ga. wall tubes with 11/16" hex cold rolled steel axles, spring retained. Standard A50 bearings are light oil lubricated. 750 lbs. roller capacity. 3.00 in 4.50 in 6.00 in 9.00 in 12.00 in Channel, Set High 5" x 1-1/2" x 3/16" formed steel channels with 5-1/2" x 1-1/2" x 3/16" bolted channel crossties see available BFR 4" Cast Iron V-Groove and 5" Phenolic. 1" pipe with hand grip. 2500 lb Non-precision, oiled, 11/16" hex axle 15-61 in Floor mounted track. Larger pass thru clearance. TCT25 Model TCT25 Gauge Roller Thru Transfer Car These heavy duty transfer cars allow product to be moved from one lane to another parallel lane within a system. 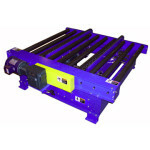 The tilting platform facilitates easier product transfer. Requires TC4 track sold seperately. 4" V-groove steel and 5" phenolic. 1" schedule 40 black pipe with plastic hand grip. N/A 39-72 in 2.5" dia., 11 ga. wall tube with 11/16" hex axle, spring retained and lightly oiled bearing. 3.00 in 4.50 in 6.00 in 9.00 in 12.00 in Channel, TC2500, 5"x1-1/2"x3/16", rollers set 1/4" high see available BFR 4" V-groove steel and 5" phenolic. 1" schedule 40 black pipe with plastic hand grip. Non-precision, oiled, 11/16" hex axle 13-61 in 8" x 2" 3/16" thick bolted on formed channel. 13" dia. air springs, plumbed with 1/4" dia. nylon tubing. 1159 cubic inches per cycle at Maximum 80 psi. Standard hand valve, 2 position, 4-way, detent,1/4" NPT ports, with 20' coil hose mounted on stand. TCT26 Model TCT26 Gauge Roller Thru Transfer Car These heavy duty transfer cars allow product to be moved from one lane to another parallel lane within a system. 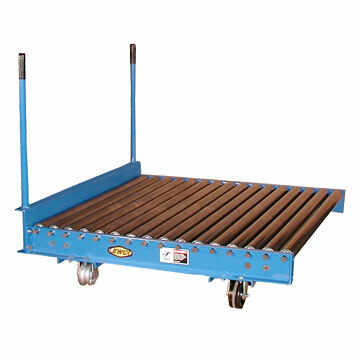 The tilting platform facilitates easier product transfer. Requires TC4 track sold seperately. 4" V-groove steel and 5" phenolic. 1" schedule 40 black pipe with plastic hand grip. 2500 lb (requires 80 PSI) 39-72 in 2.625" dia., 7 ga. wall tube with 11/16" hex axle, spring retained and lightly oiled bearing. 3.00 in 4.50 in 6.00 in 9.00 in 12.00 in Channel, TC2500, 5"x1-1/2"x3/16", rollers set 1/4" high see available BFR 4" V-groove steel and 5" phenolic. 1" schedule 40 black pipe with plastic hand grip. Non-precision, oiled, 11/16" hex axle 13-51 in 8" x 2" 3/16" thick bolted on formed channel. 13" dia. air springs, plumbed with 1/4" dia. nylon tubing. 1159 cubic inches per cycle at Maximum 80 psi. Standard hand valve, 2 position, 4-way, detent,1/4" NPT ports, with 20' coil hose mounted on stand. PTC Powered Transfer Car The Powered Transfer Car is typically used in conjunction with a top mounted conveyor for shuttling product from conveyor line to conveyor line. (4) Flange steel wheels with 1 15/16" CRS axles. 3000 lb 36 to 120" in 1" increments. 3/16" formed steel channels with 3/16" formed steel channel cross ties 30 to 120 in 1" increments N/A 3,000 lb maximum Sealed pre-lubricated, cast iron housing ball bearing. N/A Standard D126: Base mounted, between wheels. Drive has a cast iron worm gear speed reducer with a standard M13 3/4 H.P. 230/460 brake motor. Standard 40 feet per minute. Also available from 20 to 60 fpm. Multi Strand Chain Conveyor (MSCC) Top. Chain Driven Live Roller (CDLR) Top. Electrical Control: magnetic starter, combination starter, DC variable speed drives, photo-eye and various part sensors. Elevations above stated minimum. Flange wheels in place of V-groove & flat wheels. Speeds other than listed above.